HALBAN To raise awareness about the field of logistics as an attractive career path, a talk on the Oman National Logistics Strategy was conducted by Ibrahim Al Bakri, Programme Manager of the National Logistics Strategy Human Capital at the Oman Global Logistics Group SAOC. 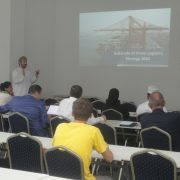 The talk was held at the German University of Technology in Oman (GUtech) last Wednesday afternoon. “Logistics is one of the fastest growing departments at GUtech,” said Prof. Dr. Heba Aziz, Head of the Department of Logistics, Tourism and Service Management. The talk was part of a series of presentations organized by the Department of Logistics, Tourism and Service Management of the Faculty of Business and Economics. Al Bakri said that in future university students may play a pivotal role as so-called “Logistics Ambassadors”, raising awareness about a field that is currently little known within the community in Oman. The Oman Global Logistics Group SAOC was founded in 2016. According to Al Bakri the long-term goal is to develop, promote and position the Sultanate of Oman as an international logistics hub and as a logistics brand within the coming twenty years. “The aim is to increase the global logistics ranking and to be among the best 30 logistics hubs,” said Ibrahim Al Bakri while benchmarking Oman with Dubai and Singapore, the current leaders in Asia. In his talk Al Bakri mentioned that in February 2017 a total of 74,000 jobs were available in the logistics sector in Oman. This number shall raise to 200,000 by 2030 and to 300,000 by 2040. The priority sectors for logistics in Oman are mining, fisheries, chemicals, food processing and agriculture. A total of 70 activities were identified as being part of logistics such as freight transport by road or ship or renting of trucks with a driver. Al Bakri stressed that one of the important aspects is to reduce the time for cargo clearances at the Omani borders and to increase research and development in logistics. The GUtech Beta Team is the winner of the Microsoft Imagine Cup 2017. 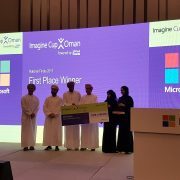 The Computer Science team composed of two GUtech students from the Computer Science Department, Alya Al-Shanfari and Hana Al-Raisi, as well as an Omani inventor, Sultan Al-Subhi, won the first prize for their project Bee, an app that is connected with Beacons technology for retail shops which aims to enhance the shopping experience and understand the context of the environment of the shopper. The competition was held at Hormuz Grand Hotel under the patronage of Sheikh Talal Said Marhoon al Mamari, chief executive officer of Omantel. The Microsoft Imagine Cup is a global technology competition that aims to deliver educational, entrepreneurial and employment opportunities for youth by acquiring critical skills. The GUtech winning team Beta will participate in the Imagine Cup MEA semifinals in Lebanon in May. 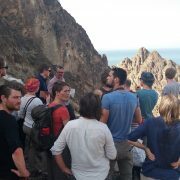 A group of 20 students from three different universities in Germany and two Geosciences professors from RWTH Aachen University and the University of Bonn conducted a two week excursion around the North of Oman. The excursion was headed by Prof. Dr. Goesta Hoffmann a geologist at the Steinmann Institute for Geology, Mineralogy and Paleontology, University of Bonn and Prof. Dr. Peter Kukla, Head of the Energy and Mineral Resources Group and the Geological Institute at RWTH Aachen University. Both professors have been highly involved setting-up the Department of Applied Geosciences at GUtech around ten years ago and continue to serve as fly-in professors. For his recent work and research in Oman, Prof. Dr. Goesta has received the Research Award of the Research Council in 2016. 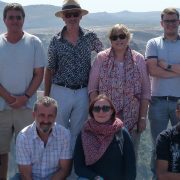 “We are pleased to conduct the excursion in Oman because it is an incredibly fascinating country which to date remains beyond the realm of large mainstream tourism,” explained Prof. Goesta, who lived in Oman for six years. 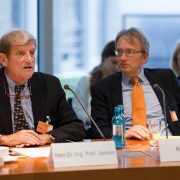 “With Oman being a Muslim country, the excursion also aims to promote cultural exchange between Germany and Oman,” said Prof. Goesta. “Oman offers an exciting opportunity for integrated geographical, geoscientific and socio-economic studies and perspectives,” said Prof. Peter Kukla, who has been conducting research related to oil and gas exploration and production together with PDO for the past 15 years. Therefore, during the excursion various geoscientific questions related to the professor’s research in Oman such as the remaining oil and gas potential, future minerals and metals resources, the development of the Omani coastline as well as geographical questions were discussed. Further issues addressed were the fast transformation of the Omani landscape – coasts, deserts, oases, flora and fauna – and the social developments in Oman. This included the transformation of the agricultural industry and the overall structural transformation and challenges Oman is facing while transforming from an oil-based economy towards a more service-oriented economy. Towards the end of the excursion in Muscat, the group conducted a walking tour between Old Muscat and Muttrah, along an old donkey trail, where Prof. Goesta explained the development of the mountains and the remains of a several centuries old falaj system. After the tour the group visited Souq Muttrah, which has been transformed from a local market to a ‘tourist market’ in the past years, a development that was enhanced by increasing mass cruise tourism. This has caused various negative impacts such as overcrowding and the change of the overall identity of the souq. This development was explained by Manuela Gutberlet, a PhD candidate at the Department of Geography at RWTH Aachen University and PR manager at GUtech who has been conducting research on the impacts of mega cruise tourism in Oman. For the second time Prof. Goesta Hoffmann and Prof. Peter Kukla lead this interdisciplinary excursion under the auspices of the Geoverbund ABC/J for post-graduate students and doctoral candidates from the fields of geography and geosciences of the three universities in Aachen, Bonn and Cologne and the large federal research facility in Juelich. 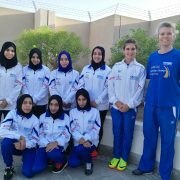 A group of seven students are currently conducting their work and study experience days at GUtech. During four days the students are familiarized with life on campus. 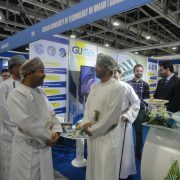 They visit various academic departments such as the Departments of Maths and Sciences, Engineering, Computer Sciences and Applied Geosciences. The students have the opportunity to meet with professors and interns from Germany and they attend lectures and meet with GUtech students. For all high school students it is the first time at a university. “We had a Physics lecture, English and Engineering. I am glad to be here. I always wanted to know more about university life,” said Fira Colderia while adding that the lectures are still difficult for her. She is now planning to choose her science subjects for A-level at school. “The days at university are much longer than at school,” said Tamar Haddein. 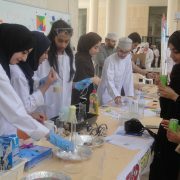 All students are highly interested in sciences. 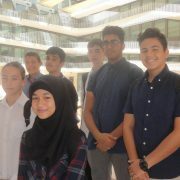 Fira would like to study geosciences or architecture in future, while Tamar and his friend Harris would like to study Mechanical Engineering. The other students showed interest in Computer Sciences and Mathematics. Only one student said that he did not know yet what to study. GUtech offers Bachelor of Engineering and Bachelor of Science programmes in Applied Geosciences, Computer Sciences, Mechanical Engineering, Process Engineering, Environmental Engineering, Logistics, International Business and Service Management, Urban Planning and Architectural Design. 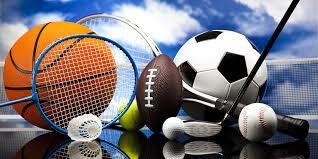 All programmes are taught in English and internationally accredited by ACQUIN.